Are you familiar with the fact that Office 365 provides a number of shared mailboxes? What are these shared mailboxes? And how can we cope with these and what are Office 365 shared mailbox limitations? Basically, the shared mailbox is just a mailbox with limited resources, like size, that can be created with a full / complete mailbox license. A Shared Mailbox in Office 365 is free and does not require a license, but there are limits to using Shared Mailbox. The size limit for free access in shared mailboxes is limited to 50GB capacity and cannot be accessed as a primary mailbox. It simply means that you must have a full license to attach to them. 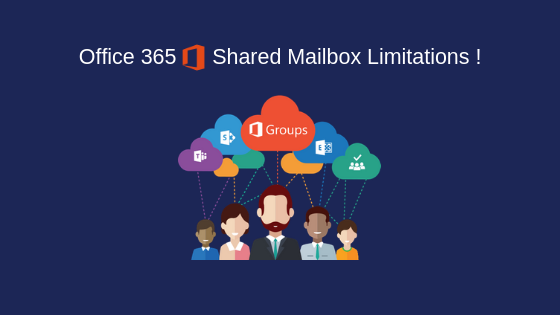 Therefore, in the upcoming section, we are going to explain Microsoft Office 365 shared mailbox limitations in an absolute way. A shared mailbox is considered as an inbox that allows many people to send or receive mail from the same email address. It becomes good for the company that might want to share load response to customer inquiries. Let’s suppose that a member of the shared mailbox may respond to the sent mail to shared address. Even a response will show as if email is sent from a shared mailbox, rather than a single person. It is a complete functional mailbox, but it is not someone’s primary mailbox. Alternatively, it is a mailbox that anyone else (individual or group) who needs to monitor and might be able to reply. This functionality is used in almost every business. A shared mailbox exclusively has no owner and also does not have its own password. Thus, no one can directly login to a shared mailbox. An admin can add you as a member of shared mailbox, and you can access either online or through the email client. Allright Then, What are Office 365 Shared Mailbox Limitations? You cannot add public folder email address or anybody from outside the company to a group of people with full access to mailbox. So if a salesman likes to use Google account, you cannot add address to the people allowed to use a shared mailbox. A shared mailbox can only be accessed through Outlook desktop or Outlook Web client. It means if you need to get it from mobile phone, you should use your phone browser. It will become a tragedy for mobile users. Each shared mailbox has the maximum size of 50GB but after licensing a shared mailbox can be extended. You can also send and receive encrypted emails. It is free and does not require a license in Office 365, but every user needs to access an O365 shared mailbox that must assign a license. Cannot be easily accessed by other users with Exchange Online Kiosk license. Office 365 Shared mailbox does not require username and password and users cannot directly log into it. Users must sign in to their own mailbox and open shared mailboxes using required permissions. Example: A shared mailbox is not associated with an individual user and is broadly configured to access by several users like HR, Sales team, and departmental users. Cannot be used for archiving emails and journaling. Does not support Office 365 Unified Messaging feature. Active Directory user connected with shared mailboxes is always an inactive/ disabled user account. 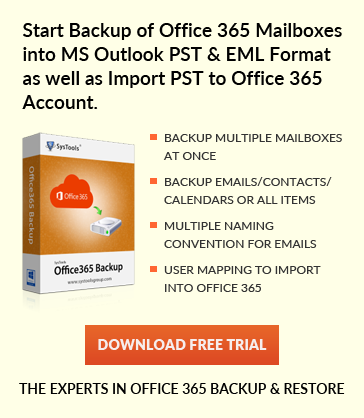 Now after analysing the properties of a shared mailbox in Office 365, if a user somehow needs to export the data of shared mailbox or needs backup, then there is no manual method for this task, but no worries, a trustworthy third party tool like Office 365 Backup Tool is a perfect way to export and backup Office 365 shared mailbox data. Users can easily extract data from their shared mailbox and save it to local storage. Microsoft Office 365 creates multiple shared mailboxes. In fact, these shared mailboxes have become crucial for businesses. However, there are some limitations to create a shared mailbox in Office 365 and it makes the user worried about data. Therefore, in this blog, we have covered limitations on Office 365 shared mailbox in a proper way. Make sure you understand Office 365 shared mailbox limitations as clearly as possible.